This is a nice sheet for the F-84G. Both Tamiya and Revell produce nice kits of this variant and most of use will use one or the other. 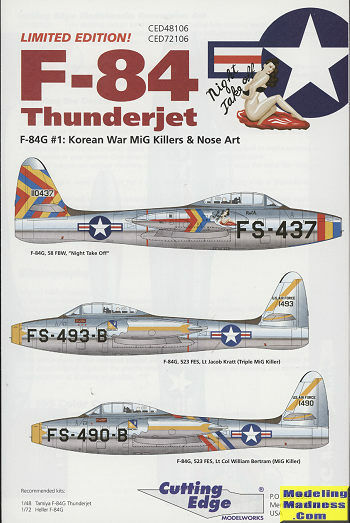 The Thunderjet was used mostly as a fighter-bomber during the Korean war and did well in that role. From time to time, they were attacked by enemy aircraft and were able to score a few victories. Such is the case with two of the options here. They could also wear some very colorful markings and that is also provided on this sheet. First is 'Night Take Off' as flown by the commander of the 58th FBW in 1952. 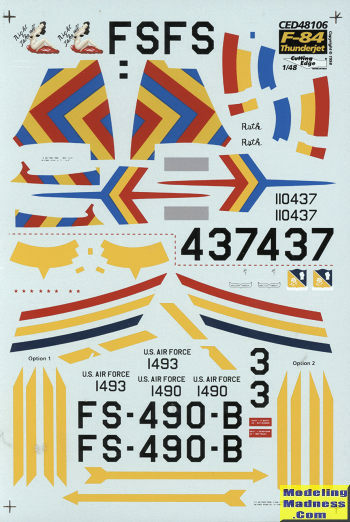 It carries the colors of the three squadrons attached to the wing. From January 1951 and with the 523rd FES is the plane of of Lt. Jacob Kratt. His score is three (two MiG-15s and one Yak-9). Next is the first MiG killer as flown by LtCol William Bertrand, also in January 1951. This 523 FES aircraft scored a MiG-15. Remember that last decal review of the stencils? Well, you'll need them unless you use the kit bits and none are included nor are insignia.